Last year, I ran an anonymous survey for traditionally published children's authors. Hundreds of authors participated and the results for young adult, middle grade, and picture books categories painted a detailed picture of the life and livelihoods of children's authors. After I published these results, a few people contacted me saying it's easier/better/more profitable to self-publish. I had guesses but not enough information to respond or verify. I wanted to know more, so from January to May (2018) I opened a survey for "Non-traditional Children's Book Publishing." 3) through a company where the author pays for or crowdfunds at least part of the publishing project. Authors identifying as "self-published" or "indie" were welcome to participate as long as they met these requirements. In the end, seventy-eight authors submitted answers. THANK YOU authors! 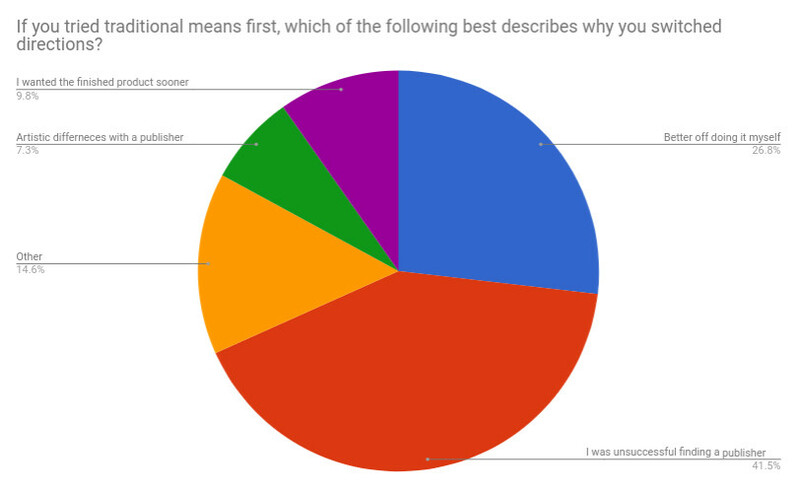 A note about the term "indie author"
Some people thought I should call this survey an "indie author survey" instead of "non-traditional" or "self-published." However, while advertising for the survey, "indie" created some confusion. Some people seemed to think indie means published under a small, traditional, and advance-paying press. Not so. Indie means the author manages their own publishing brand and becomes their own house. Because of this confusion, I chose to identify all authors participating in the survey under the umbrella term "self-publishing." Feel free to discuss this more in the comments. Ethnicity: 8.2% Hispanic or Latino, 1% Filipino-American, 1% Ukrainian, and the remainder simply identified as "not Hispanic or Latino"
Age: The ages ranged from 19 to 85 years old. The average age was 46. I didn't have a large enough sample to feel confident breaking the data into sub-groups. However, if there's interest, I can look up specific information, like "30 year old female Hispanic picture book writers from the United States." Authors rated their levels of experience in writing, editing, and marketing on a scale from 1 (hobbyist) to 5 (expert). Most authors in the survey were confident in their writing and editing abilities. However, only about 20% of self-published authors considered their marketing skills above average. Authors rating their marketing skills at a four or five sold about twice as many books as those rating themselves at three or lower. That said, the two bestselling authors rated their marketing skills as average. Both these authors paid for marketing and other services prior to releasing their books. The third bestselling author, rated her skills as excellent (5) in writing, marketing, and editing. This author did not pay for marketing services, only for illustration/design services, prior to publication. All authors selling in the top 30% invested money in their books prior to launch, except one. Most (70%) published under their own brand label, and most (74%) have multiple self-published books. I created a word cloud of the most common expenses these bestselling authors experienced. Larger words means more of the authors experienced these expenses, not necessarily that one type of expense was larger than another. Now, let's take a look at authors in the bottom third of the sales numbers. On average, these authors rated themselves slightly lower in writing and marketing compared to the top third. However in editing, they rated themselves slightly higher. Specifically, writing: 3.6 vs 4.0, editing: 3.8 vs 3.7, marketing: 2.3 vs 3.1. I looked through the data and tried to find more of what set them apart from the top third. A few things stood out among the bottom third. Authors chose self-publishing for a variety of reasons, most of them personal. 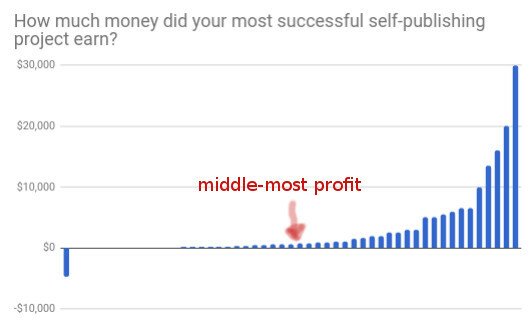 In fact, only about 5% of self-published authors indicated "making money" was their primary goal. Suprisingly, none of the top 10 income earners listed "earning money" as their primary goal. According to the survey results, publishing with the goal of making money doesn't necessarily bring home the bacon. The most common reason people left traditional publishing is because they were unsuccessful finding a publisher. "Other" reasons people switched from traditional publishing included many varied responses like, "I was getting a lot of interest from fans in pre-marketing" and "Self-publishing just happened for me." Do traditional publishers sign contracts from self-published works? Rarely. One author in the survey had his/her self-published book picked up by a traditional publisher. This authors sold 10,000 copies of his/her book prior to being contacted by a traditional publisher. If you're hoping to take this route, be prepared to sell a lot of books on your own first. Is self-publishing a good way to attract a traditional publisher's attention? No. Self and traditional publishing are mostly orthogonal career paths. The vast majority (99%) of self-published titles are not picked up by a traditional publisher, and most literary agents won't represent self-published titles. However, it's possible to pursue self and traditional publishing concurrently. Many self-published authors also have experience with traditional publishers. It's possible to switch back and forth between self and traditional publishing. However, self-publishing is not usually considered a "resume builder" in traditional publishing. Did most authors accomplish their primary goal with self-publishing? The average rate of satisfaction was favorable: 6.8. No author felt like they completely failed at their primary goal, and a few authors (5%) were totally satisfied with the product. Half of the authors completely satisfied with their project had the goal to "create something memorable for friends and family." Reaching child readers and establishing themselves as an author were the most common reasons people gave for self-publishing. Beyond these leading reasons, the authors most likely to be disappointed were those hoping to make money. Satisfied authors published for a variety of reasons ranging from creating social change to catering to a niche. Notably, one author wrote with the goal to "change the world" and was more than half-satisfied with the outcome. Overall, most people self-publishing were happy with their end product. Can you earn a living self-publishing books for children? One person in the survey earned $40,000 self-publishing last year. Here are a few helpful facts about this successfull self-published author. Two other people in the survey earned over $10,000 last year self-publishing. only around 1% of people self-publishing for children earn a living off it. It is possible to earn a living self-publishing for children, but it's rare. At least 62% earned some money self-publishing. Many people answered this question with vague answers like, "I made enough to pay for my next book," or "I didn't make much." 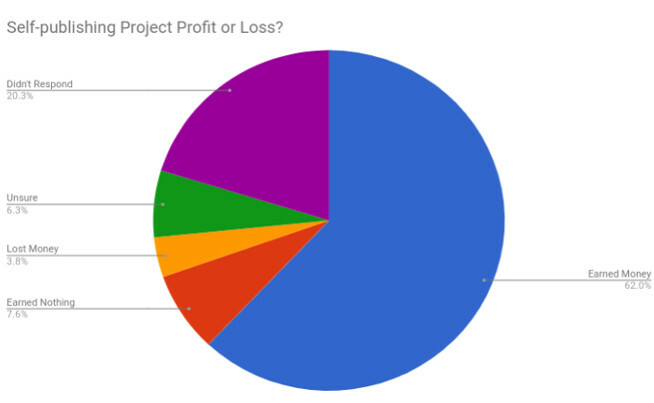 Of those that answered with a numeric value, the average (mean) amount earned on their most successful self-publishing project was about $2,900. Since the top earners skew the mean, I also highlighted the middle-most (median) profit amount above. The median amount an author made was $600. However, it should be noted that many authors did not answer this question. 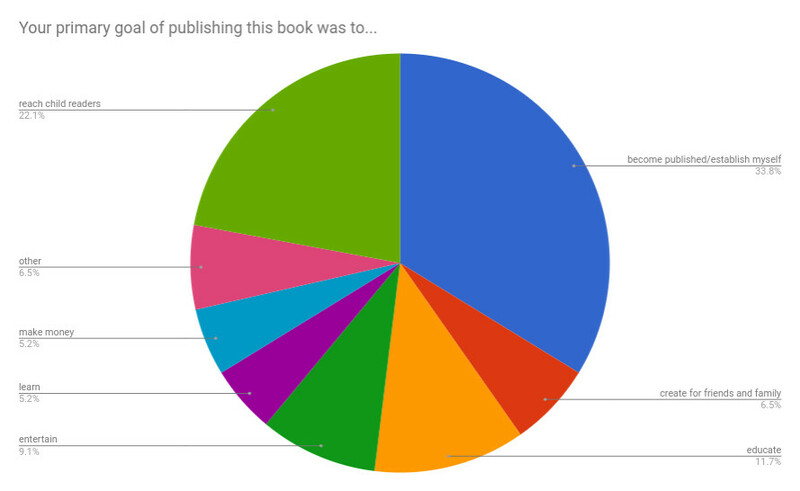 If authors didn't give me a number, I didn't include them in the graph above. Many people indicated they lost money with comments like, "Still selling to make the money I spent." So the true median profit is likely lower. Do authors selling the most copies make the most money? It's unclear. Authors selling the most copies were the most likely to invest in their projects. Not all of them made enough money to break even. Very few of the highest sellers disclosed finances. Fortunately, the author selling the highest number of copies did. This author made about $30,000 on his/her most successful project. After expenses, he/she earned $0.87 per book (roughly the same amount earned by a traditionally published author depending on the royalty rate). Authors selling in the top 30% made less per book than authors selling in the bottom 30%, but their annual incomes were higher on average. However, given that many authors did not answer financial questions, it's possible that up to 30% of self-publishing projects for children lose money. From the data I do have, self-published authors made on average $2.70 per book sold. Self-publishing vs. Traditional Publishing: How do copies sold compare? The following charts compare average copies sold by publishing path selected, using mean and median values as benchmarks. An author selling a book to a no-advance paying traditional publishing house can expect to sell about as many copies as if they had self-published: 477 books. On average, advance paying houses sell significantly more copies than non-advance paying publishing pathways. As always, there are exceptions. The bestselling self-published author in my survey sold 35,000 copies. Here's the spread of copies sold for self-published children's authors. According to the data, self-publishing sales follow a roughly exponential curve. A few do very well. 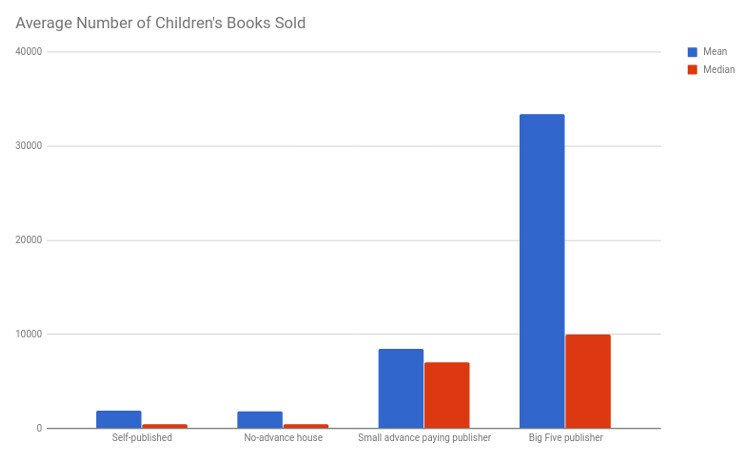 However, 25% of self-published children's books authors sell fewer than 100 books. Self-publishing vs. Traditional Publishing: How do annual writing incomes compare? The average incomes of traditionally published authors were higher than those of self-published authors. However, when you look at annual writing incomes for authors publishing at no-advance houses, the averages are very comparable to self-publishing. Self-published authors should retain the rights to their work. 99% of the authors in the survey retained all their publishing rights no matter what services they used to publish, including 2% who shared rights with an illustrator. Self-publishing isn't inherently better or worse than traditional publishing. It's a just different experience, easier in some ways and harder in others. Whether or not you decide to self-publish depends on your goals, needs, and skills as an author. Here are a few key takeaways from the Non-traditional Children's Publishing Survey. I hope this information was helpful. Do you have a question not answered in this post? Comment below. If there's an answer in the survey data, I'll dig it up for you. Happy writing trails and best wishes on your publishing journey! Hannah Holt is a children’s author with an engineering degree. Her books, The Diamond & The Boy (2018, HarperCollins/Balzer+Bray) and A Father’s Love (2019, Penguin/Philomel) weave together her love of language and science. She lives in Oregon with her husband, four children, and a very patient cat named Zephyr.